Looking for a digital piano with a full sizes keyboard? Then you need to learn more about the top ten best 88-key keyboards listed here. Digital pianos come in so many shapes and sizes that it can be hard to choose between them. One of the most important factors is the size of the keyboard. If you want to advance your technique quickly and transfer to an acoustic piano, then you need a digital piano with an 88-key keyboard. In this article we will discuss the best 88-key keyboards and provide a buyer’s guide with everything you need to know to make the most informed purchase. 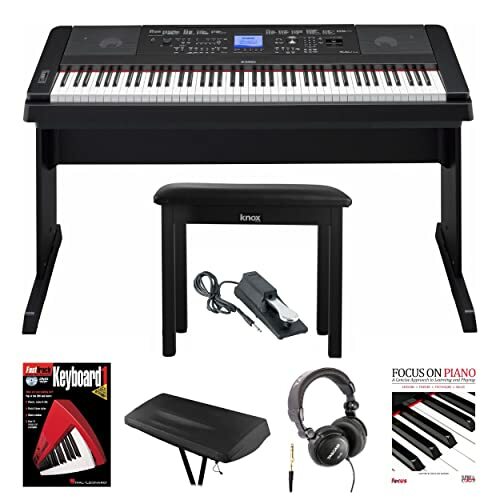 Summary of features: 88 graded hammer standard keys, 100 preset songs, Yamaha education suite, and microphone. If you want the full package digital piano, you have come to the right place. With regards to this, the Yamaha DGX-660 includes features that are tailored to teaching piano skills in the most realistic way possible. For example, the keyboard has 88 keys that uses a GHS weighted system. This feature makes the DGX-660’s keys feel like those of an acoustic piano. Additionally, Yamaha includes everything that you need to get started. Need a stand, bench, music stand, metronome, and more? The Yamaha DGX-660 has you covered. Has a number of interactive learning features, including The Piano Room function, preset song, and Yamaha’s education suite. The DGX-660 piano uses Yamaha’s CFIII 9-foot concert grand piano. The GHS keyboard recreates the feel of an acoustic piano by requiring a heavier touch on the lower pitches than the higher ones. Yamaha’s included headphone is not the best on the market. Do not expect them to sound like Bose’s products. There is not Bluetooth connection on the DGX-660. The speakers tend to create static when the upper octaves are played. Summary of features: 88 fully weighted keys, 10 different voices, dual mode for combining multiple voices together, and only 25 lbs. Yamaha’s P-71 is an Amazon exclusive product. Notably, it comes with a full-sized keyboard of 88 GHS weighted keys. What is more, it is also designed to be streamlined and light, so it will fit anywhere you need it to go. Plus, you get access to Yamaha’s amazing sound engine with the purchase of the P-71. Keep in mind that this product is streamlined, so you will have to purchase your own accessories. But, that extra requirement is worth it. If you want a realistic and flexible digital piano that will make you a better player, then you need to try a Yamaha P-71. The fully weighted keys on the Yamaha P71 use the company’s GHS system. That is to say, the keys on the lower end of the keyboard will feel heavier than the those at the higher end, which mimics an acoustic piano. Most of the settings on the P71 can be changed with a quick switch of a button. Yamaha uses Advanced Wave Memory (AWM) for their sound sampling, which creates a deeper and more realistic sound. This digital piano does not come with a bench or stand. Specifically, you will have to make a separate purchase to be able to play it as an acoustic piano. There is no included MIDI connection on this digital piano. Using the sustain pedal correctly can be a problem because you have to plug it in before turning the keyboard on. If not, the sustain pedal will cut off the sound. 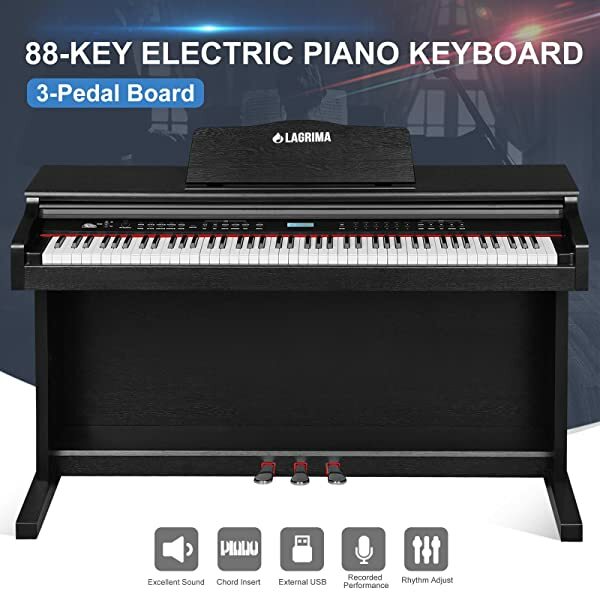 Summary of features: 88 keys with hammer compact action, built-in stereo speakers, Bluetooth and MIDI ports, built-in Alfred Piano Lessons, damper pedal, and 192-note polyphony. 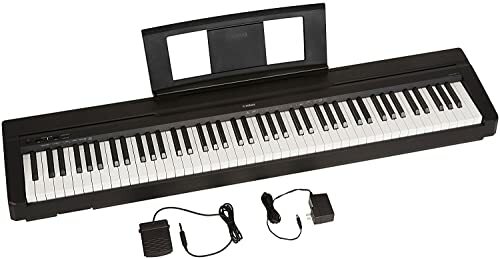 The Kawai ES110 Portable Digital Piano is perfect for anyone looking for one of the best digital pianos for beginners. It has a large amount of polyphony (192-notes max) and comes with built-in Alfred Piano Lessons. Moreover, the 88-keys on the ES110 use a grades weight system. 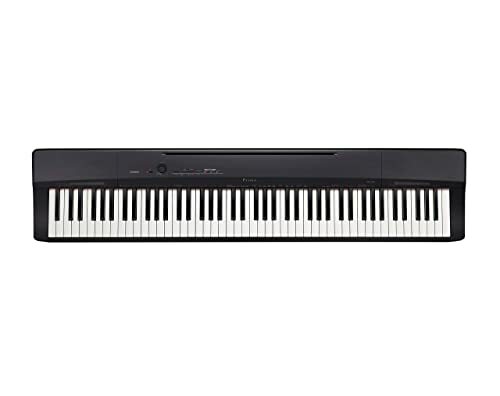 Finally, the advantage of the Kawai ES110 digital piano is its affordability. You receive a lot of features for your money. Not to mention, the flexibility and versatility of this entry-level digital piano are unmatched. 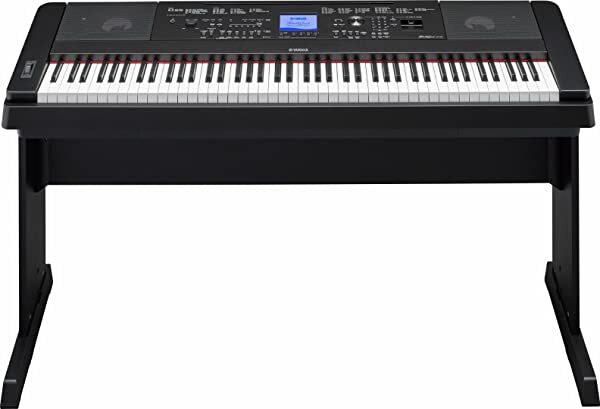 The Kawai ES110 portable digital piano comes with nineteen sounds, eight of which are piano sounds. Built-in features include Alfred piano lessons, stereo speaker system, Bluetooth and MIDI ports, and three-song recorder. You can choose between dual and split modes for more playing and recording options. The stand and pedals are optional additions, which will raise the price of the Kawai ES110. You are not able to install extra sounds into this digital piano. However, if you are not satisfied with what comes built-in, then you should look for a different product. The keyboard is not as high-quality as some of the other products on this list. Too, the keys make noise when pressed and occasionally will get stuck. Summary of features: 88 GHS keys, 192 max polyphony, 24 voices, 21 demo songs and 50 piano songs, and metronome. 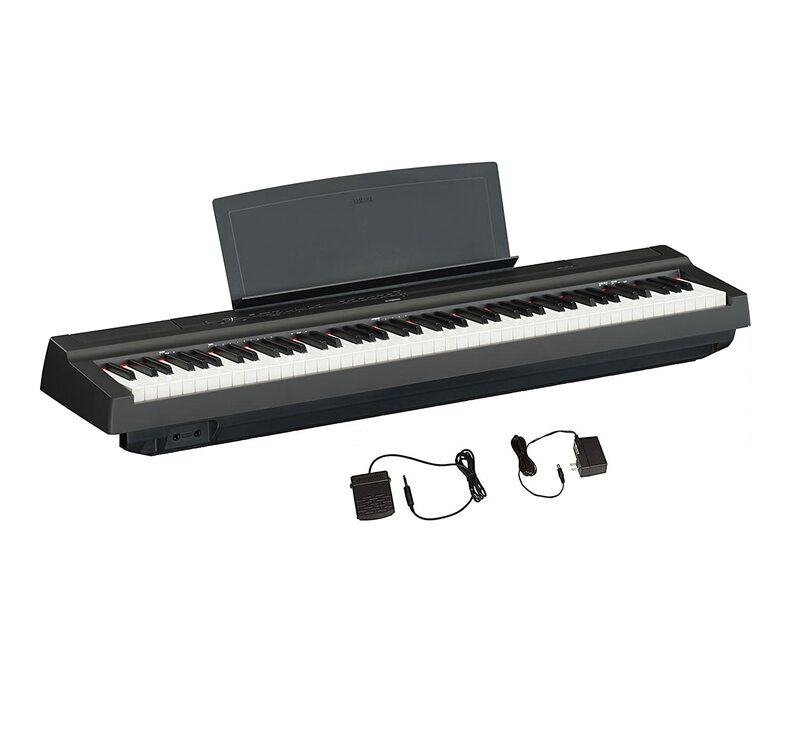 The Yamaha P125 Digital Piano is easy to use and primes any beginning player to learn the instrument. Furthermore, Yamaha has added a newly improved two-way speaker system for realistic, stereo sound. In particular, the speakers face both up and down, which produces a sound much like the one you would hear on an acoustic piano. Yamaha provides access to their Smart Pianist app with the purchase of the P125. This app is a perfect tool for learning to play the piano. So, if you are an advanced player, the Smart Pianist app still has something for you. Try out the chord tracker function, intuitive controls, and recommended song features of the app. 88 fully weights GHS keys for realistic playing. Yamaha’s Pure CF sound engine is included, which mimics the tone of their DFIIIS Concert Grand Piano among others. Yamaha includes lots of connectivity features, including MIDI and audio transfer. And, only one cable is needed to increase the software capability of this digital piano. The sleek design is great for some people. But, if you want a traditional looking digital piano, this is not the product for you. The stand is not included with your purchase of the P125. The pedal tends to break easily and feel flimsy under the feet. Summary of features: 88 naturally weighted keys, three touch controls, 120 max polyphony, eight sounds, and built-in metronome. Korg’s B1SP Digital Piano is a great acoustic piano replica. We mean, this digital piano produces acoustic and electric piano sounds faithfully. But, it does not have the connectivity that many digital pianos feature. You can not hook this instrument up to computer or other sound systems. Korg does provide educational materials. If you want to teach yourself the piano, then the B1SP is the instrument for you. Additionally, it comes with the “Focus on Piano” learning guide and has the standard three pedals. Plus, this instrument comes with all of the accessories you need to set it up in your home. The transition from digital to acoustic piano is easy with the Korg B1SP. 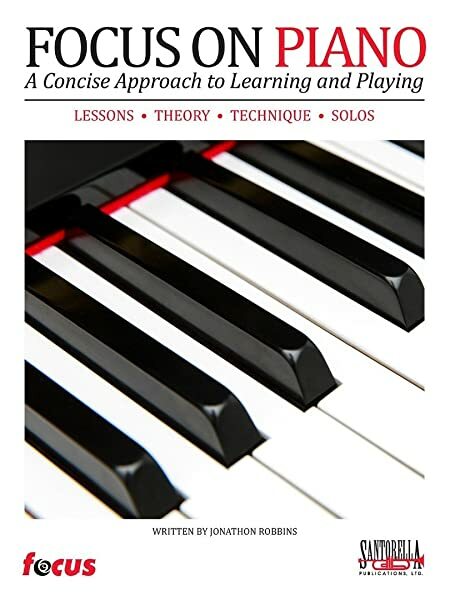 Comes with “Focus on Piano” piano learning guide for easy self-guided study of the instrument. The eight different sounds include three different acoustic pianos. Also, two electric pianos, a harpsichord, and two organ sounds are included. The speakers come with an active servo that reduces distortion and replicates a realistic acoustic piano tone. The headphone jack is not conveniently located for most players. Furthermore, you may have trouble connecting most standard headphones to the instrument. The B1SP is not a performance piano but is designed for practice and education. So, the speakers are not loud enough to be heard in a venue. And, there is not an aux out connection for you to hook the keyboard into an external sound system. The keyboard does not have a lot of connectivity options. Therefore, it will not attach to your laptop of computer. Summary of features: 88 fully weighted hammer-action keys, 5-pin MIDI output, pedal inputs, USB powered, and multiple keyboard zones. 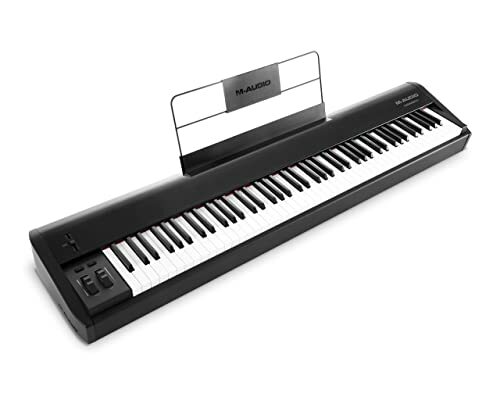 A piano player’s digital piano, M-Audio’s 88 Hammer Piano is designed for you in mind. And, it comes with an unbelievable amount of software. However, most of the programs are better for the advanced digital piano player. Yet, M-Audio does include a three-month subscription to Skoove. 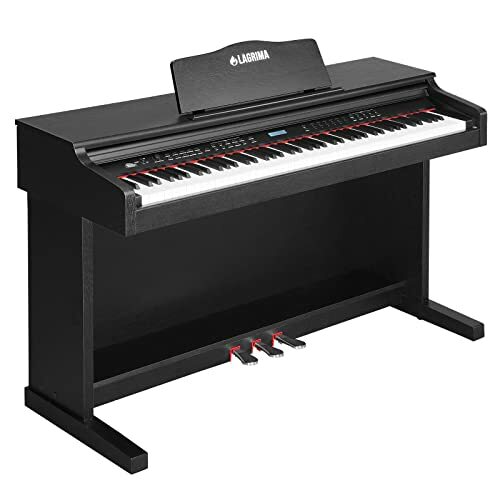 M-Audio’s 88 Hammer Piano has unparalleled sound and flexibility. What is more, you can attach MIDI devices, assign MIDI buttons, create a multitude of effects, and create multiple keyboard zones. Therefore, if you are a creative and cutting-edge piano player, you need the 88 Hammer Piano. M-Audio includes more software than any other product on this list. You receive Pro Tools|First, Ableton Live Lite, Eighty Eight, Mini Grand, Velvet, Skoove, and DB-33 with your purchase. The 88 keys are fully weights and use hammer action, just like an acoustic piano. 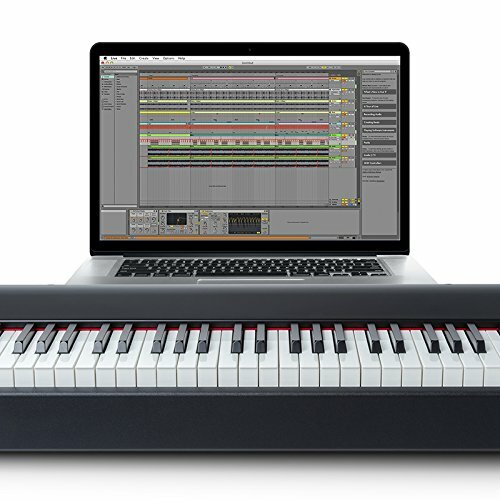 M-Audio’s 88 Hammer Piano does not require drivers to connect to your Mac or PC. Instead, the instrument supports plug-and-play connectivity. All of the features of this digital piano make it better for the more experience player. Therefore, beginners may struggle with this one. You can not secure the 88 Hammer piano to its stand. Thus, the instrument is not great for children, who may knock it over. The instrument supports the three standard piano pedals (sustain, expression, and soft). But, they are not included in the purchase. Summary of features: 88 semi-weighted keys, LED buttons, eight pads, MIDI out, and Nektar DAW integration. For the digitally-minded person, Nektar’s Impact LX88+ has it all. This USB MIDI controller is perfect for a songwriter, or anyone looking to take their musicianship to the next level. For instance, it comes with a premium software suite and many different MIDI options. Plus, the eight hyper-sensitive backlit pads aid your MIDI programming. Access all of the Impact LX88+’s features with just a press of a button. Not to mention, Nektar will even include their Bigwig 8-track digital audio workshop for press. You seriously need to try one today. Automatically hooks up to Nektar’s DAW (digital audio workstation). You can choose between the MIDI Out and MIDI programming options. The keyboard has 88 keys with medium tension with semi-weighted action. And, the keys are easy to depress. You cannot control the touch level of the Impact LX88+’s keys as you can with other manufacturer’s products. This product is only a MIDI keyboard. Therefore, it does not produce its own sounds and is not a performance instrument. The Impact LX88+ does not come with its own stand. Summary of features: 88 hammer-action and weighted keys, hall simulator and reverb, AiR sound source, dual headphone outputs, and weighs under 26 lbs. Casio doesn’t always have a great reputation with digital piano players. But, that infamous repute is not warranted. The Privia PX-160BK is an affordable and versatile digital piano. Too, it comes with a keyboard that plays just like the real thing, even if the keys may not feel right to some people. The Privia PX-160BK has very good connectivity. And, it comes with two headphone outputs on the front of the instrument. Also, there are the USB connection ports, which allows you to hook your piano up to a Mac or Windows machine. In all, the Privia PX-160BK is a solid and affordable digital piano. The keys use Casio’s famous Tri-Sensor Scaled Hammer Action II. 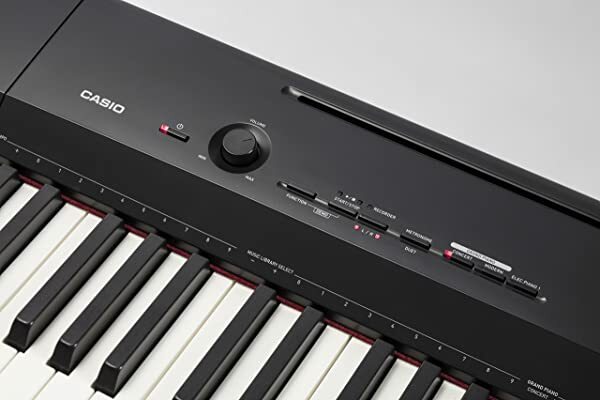 The three sensors and weighted keys make the PX-160BK’s response exactly like an acoustic piano. Comes with a new 8w x 8w speaker system, which can be placed against a wall for the best sound possible. In addition to the Casio AiR sound source, there are a number of new sounds included with the PX-160BK. The bench, CS-67 stand, and SP-33 pedal unit shown in the pictures are sold separately. The simulation ivory and ebony keys do not feel like the real thing, which can distract a player. Key sensitivity is not great when you play very fast. 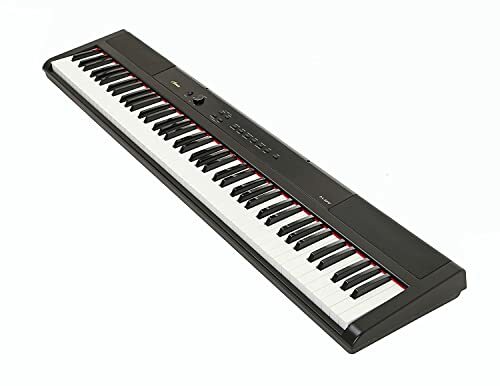 Summary of features: 88 semi-weighted velocity-sensitive keys; 12 instrument samples; music app, learning software, and DAW compatibility; and only 20 lbs. Artesia is a small company that makes a great digital piano. Also, it is one of the most affordable pianos we’ve come across. 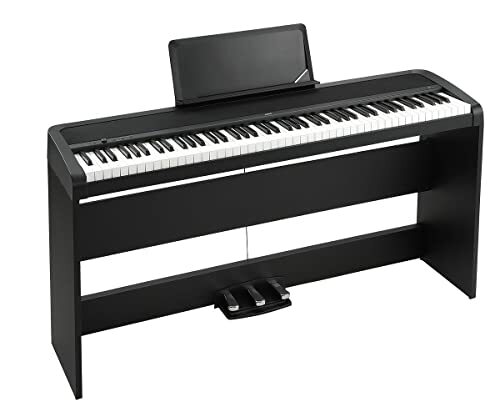 In particular, it is small, light, and includes all of the functionality that will get you started playing the piano. As you progress, the compatibility with music apps, learning software, and DAW (digital audio workstations) will level-up with you. The weighted spring action of the keys does not require as heavy a touch as acoustic pianos. However, this should not be an issue for most players. But, it could be a problem if you are purchasing a digital piano with the hope of transitioning to an acoustic piano. The velocity-sensitive keys respond well to fast playing. You can choose between five regular controls and four voice controls for added sound flexibility. The built-in metronome can be adjusted for tempo and volume. The PA-88W only comes with 32 note max polyphony. This should be sufficient for most beginning players. But, advanced players will likely need over-100 polyphony. You have to purchase the bundle to receive the PA-88W’s matching stand and bench. An adaptor is needed to use headphones with the PA-88W. Summary of features: 88 standard keys, 80 demo songs, 128 polyphony, built-in stereo speakers, USB/MIDI terminal, and two headphone jacks. LAGRIMA is well-known as a musical instrument maker in many countries, including Germany, the United Kingdom, and France. Their LG-8830 illustrates exactly why they are so popular. Similarly, this digital keyboard comes with a multitude of functions and sound options that will elevate any playing. Two people can even play this digital piano simultaneously. That feature is tied to the teaching function that improves any playing. Thus, if you want an easy-to-use and flexible product you should try the LAGRIMA LG-8830. You can create the exact sound that you want with the LG-8830 digital piano. There is an included teaching function that is designed to make you a better player. The digital piano connects to educational, musical, and other digital applications for a unique playing experience. Plus, the LG-8830 comes with recording and playback features so that you can hear your own playing. The pedals are tricky to plug in correctly. There is no lid to the keyboard, just the cloth covering. Therefore, the keys are easy to damage. If you set up the LG-8830 too close to other electronics it will hiss. That is to say, playing while using a computer app is impossible. If you’re like many people new to digital pianos, you likely think all of the products on our top ten list sound great. “How do I choose between them,” you may be wondering. Never fear. We have created this handy buyer’s guide to help you make your purchase. If you want to scoop on the important aspects of 88-Key Keyboards, read on. When you are purchasing a keyboard with 88 keys, you need to decide what type of weight the keys should be. There are not that many digital pianos made with non-weighted keys. But, you will find three different types of weighted keys on digital pianos. Weighted keys are important because they make the digital piano’s keyboard feel like an acoustic piano. Plus, they build finger strength. The three different types of weighted keys you will find are semi-weighted, hammer action, and graded weighted. Also, you may find these categories combined. Or, a semi-weighted, hammer-action keyboard may appear. Semi-weighted keys are sprung-action, which means the keys respond to your touch. For example, the heavier you play, the louder the dynamic level. Hammer action keyboards most closely replicate an acoustic piano. They mimic the hammer mechanism found in the body of an acoustic piano. Finally, graded weighted keys are heavier in the low pitches and lighter in the high pitches. Also, this mechanism tries to recreate the feel of an acoustic piano. In other words, your choice of key weight will depend on what you want to get out of the digital piano. If you plan on performing on an electric keyboard always. Or, you use the electric keyboard as a MIDI platform. Then you don’t need weighted keys. You may decide that you want keys that feel as close to an acoustic piano as possible. In that case, go for a hammer action or graded weighted keyboard. Check out our article on the best digital pianos with weighted keys to learn more about this subject. Originally piano keys were made using ivory taken from elephant, walrus, or narwhal trunks. Obviously, using actually ivory is now illegal. Therefore, digital piano manufacturers have to use synthetic ivory in their keyboards. There are different types of synthetic ivory. A variety of plastics and coated wood are now being used to keep the look of a piano keyboard without using real ivory. But, some synthetic ivories are much better than others. When you purchase an 88-key keyboard make sure that the synthetic ivory is close to the feel of an acoustic piano. It should be smooth and cool to the touch. You should not be able to feel any grain or rough surface on the keys. The player used to an acoustic piano will be most sensitive to the coatings on the keys. However, no one likes rubbing their fingers on sandpaper. Considering this, make sure that you know what the keys will feel like before you purchase the digital piano. What follows are a few non-keyboard related features that should be considered when purchasing any digital piano. Often people purchase a digital piano to learn the instrument. Therefore, you want to buy an instrument with as many educational features as possible. Some of the products listed in this article provide a trial subscription to Skoove. Or, you may get access to the manufacturer’s own educational software. Let’s discuss Skoove first. Skoove is an online, interactive piano instruction software. In particular, your subscription allows you to learn piano at your own pace and in your own time. The program provides online lesson, and interactive tutorials for beginner, intermediate, and advanced players. All you have to do is follow along, and your piano technique will improve immensely. Other educational features you may find on a digital piano include built-in songbooks, included lesson plans, and a teaching mode. All of these features help the student and the piano teacher. Therefore, to get the most out of your digital piano with an 88-key keyboard, you need to find a product with multiple educational features. Not to mention, these instruments are called digital keyboards for a reason. 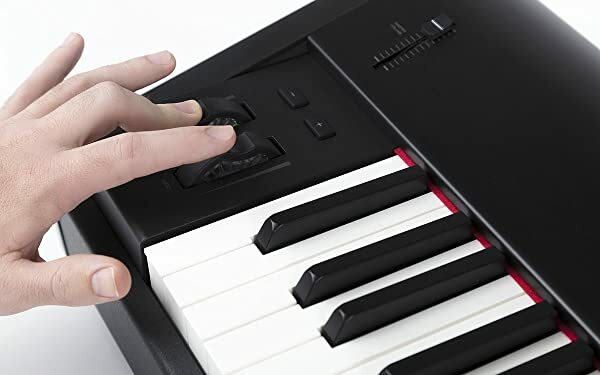 Thus, you want to be able to connect to your smartphone, laptop, or computer from your digital piano. We mean, the ability to connect your digital piano to a digital device or MIDI software. Above all, we recommend purchasing a product with simple and flexible connectivity options. Connectivity is a major issue no matter how you plan on using the digital piano. For example, if you are purchasing your digital piano to learn the instrument, you need to connect to online education apps. Or, if you are a songwriter, you need to access MIDI instruments. Indeed, some digital pianos even allow you to record and upload your songs onto a computer for editing. Namely, know how you plan on using the digital piano. This knowledge will help you decide on the level of connectivity you need. Pay attention to the type of digital piano you are purchasing. For example, some instruments are MIDI keyboards only. They do not produce their own sound. So, if you want a performing instrument, MIDI keyboards will not be for you. On the other hand, composers may not want or need sound capabilities in their digital piano. Similarly, if you are not performing on the instrument, you won’t need outputs that connect to other speakers. Consider how you plan on using the digital piano before making your purchase. Thus, you will not buy an instrument that does not have the performance capability you desire. Purchasing one of the best 88-key keyboards does not have to be a challenge or overwhelming. In fact, by keeping a few factors in mind, you can find a great digital keyboard with 88 keys for you and your family. Don’t get bogged down in the many specifics. Follow our handy buyer’s guide and top ten list of the best 88-key keyboards. Let us help you find the perfect digital piano today!